Few places on Earth are more evocative of romance and tropical luxury than Hawaii. Formed from under-sea volcanoes, this Pacific island chain is geographically diverse and breathtaking, covering all but two of the world’s climate zones. Whether you dream of a beach, waterfall, volcano or rural wedding, we can design a one of a kind experience to bring your union into bliss, sharing memories with family and friends. Hawaii is also the perfect choice for a honeymoon. A beautiful oceanfront location allows you to custom-design your perfect Hawaii destination wedding. 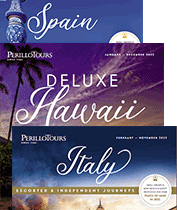 Whether you have a wedding party of two or two hundred, our knowledgeable Perillo Tours Hawaii Wedding Specialists will ensure your special day is carefully planned and hassle-free. Once you arrive in Hawaii, your Perillo Wedding Specialist will meet you at your hotel. Enhance your wedding with a romantic touch of Hawaiian blessings, leis and customs in a beautiful natural setting in Hawaii. Site conditions, fees and services will be confirmed upon receipt of reservation deposit; subject to change without notice. Images posted online for 30 days. Other deluxe wedding packages available on each island, customized to meet your budget and your dreams. Want to experience another island? Additional accommodations for the bride/groom , wedding party and guests are available. Why not add on a pre or post tour of Hawaii to round out your dream wedding! Our wedding planners are available to help you create the perfect package for your dream wedding and honeymoon.